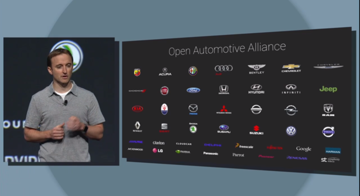 Android Auto represents Google's response to Apple's iOS in the Car platform. Both are reliant upon connected smartphones for accessing data and running compatible apps. In unveiling Android Auto, Google noted at its I/O conference on Wednesday that the average person spends an hour in their car every day, and many of those people dangerously use their phone while driving. 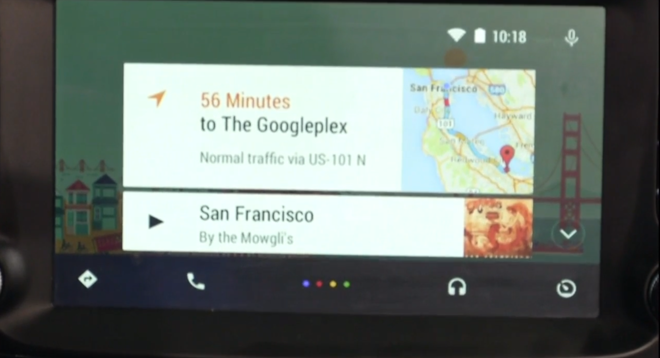 Android Auto aims to solve this by providing users with eyes-free, voice-driven navigation, communication and music. The system is contextually aware, featuring a home screen that borrows from the Google Now feature found on Android devices, giving relevant information learned from user habits, along with recent destinations. 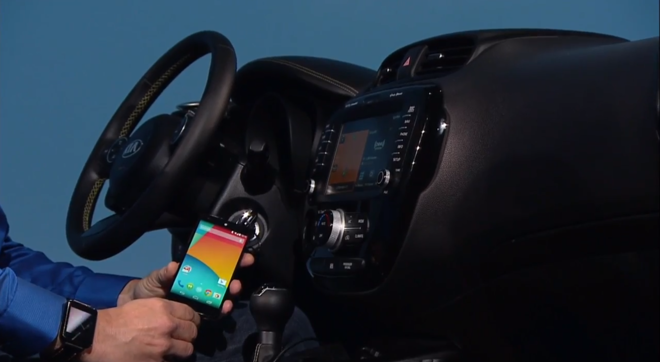 A connected Android phone will power the in-the-car display for Android Auto, but allows control with steering wheel buttons or applicable buttons on the car's head unit. Google also said that because Android Auto relies on a user's phone, the experience will improve if they buy a new and faster phone. Users can input a destination with their voice, or speak to send messages or initiate a phone call. 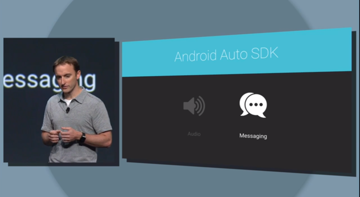 Developers will also be able to make their own music and messaging apps via a freely available Android Auto SDK. 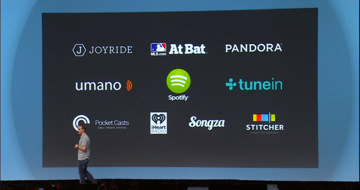 Android Auto is scheduled to launch later this year. 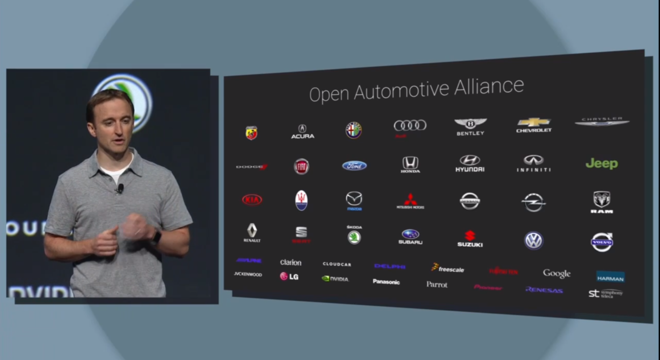 Google said on Wednesday that over 40 new partners for the Open Automotive Alliance, and over 20 new car brands have pledged to ship cars with Android in the near future. Google emphasized the need for wearable devices Wednesday by noting that the average smartphone user looks at their device a whopping 125 times per day. The company believes wrist-worn screens can lessen that number, making information more quickly accessible while on the go. 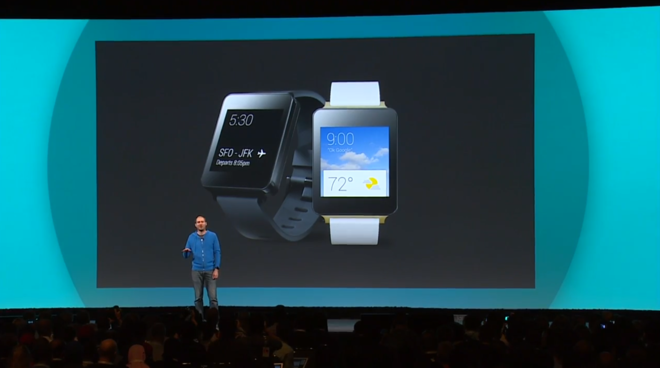 The company demonstrated the Android Wear platform onstage at I/O using LG's G Watch. All Android Wear devices will have touchscreens, and will support both circular and rectangular displays. Swiping up on the interface presents a series of Google Now cards. When a specific card is selected, users can swipe left and right to bring up information related to that card. And everything is synced between an Android watch and connected Android phone, meaning that associated Google Now cards are removed from the phone as well. 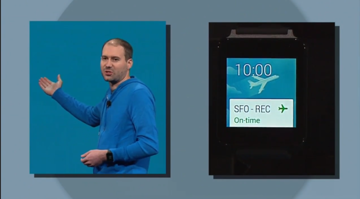 Android Wear also supports voice commands, and the onstage demo was used to show off creating reminders or creating notes. 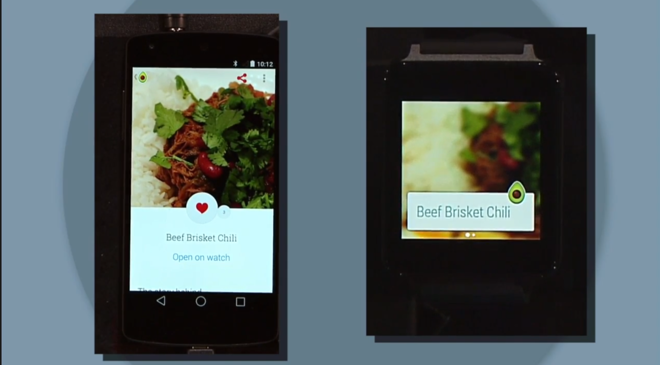 Android Wear will also respond to queries and find information quickly. Fitness tracking is also a key part of Android Wear, with one example spotlighted by Google showing the user's number of steps taken for the day and week. 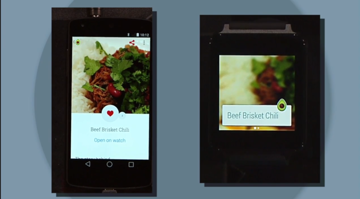 Android Wear devices made with heart rate monitors will also be able to tap into that data for compatible apps. Other apps showcased by Google on Wednesday included Pinterest, with a demonstration notifying users when they are near a restaurant featured in one of their pins, and Allthecooks, which automatically displayed an entire recipe on the watch and offered a timer when the associated smartphone app was opened. 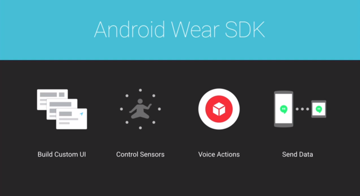 An SDK for Android Wear is available to developers starting today. 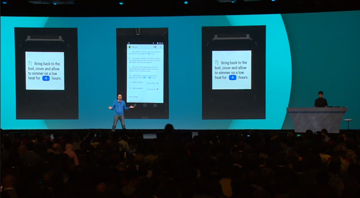 After showcasing Android Wear, Google announced a number of upcoming devices that will run its new platform. Chief among them was the new Samsung Gear Live, the South Korean company's first device to use Google's wearable platform, which will be available today to preorder from the Google Play store. Also available today is the LG G Watch that was shown off onstage. But those waiting for the Moto 360 smart watch will have to wait, as Google said it won't be available to preorder until later this summer.